ShanKri-la is a growing technology blog with a targeted audience interested in technology. In the sea of technology blogs, ShanKri-la strives to be a shining beacon reaching out to geeks and non-geeks alike. We strive to make their daily lives a little bit manageable, a little bit easier and a little bit more fun! We talk about various technology topics such as tips & tricks, browsers, software, internet technologies, blogging software & services, webmaster tools and review various products in the market. Our site visitors are a great mix of people with casual surfers (about 50%) coming from search engines for our several well ranking keywords as well as regular visitors who are bloggers, small business owners & webmasters. If you are in the process of spreading word for your brand new product or doing a launch promotion, ShanKri-la is a great way to get some exposure to a targeted audience. This is a premium 468×60 banner ad space that will appear at the top of every page in the entire site. One of the best ad options available here. Animations in the graphic welcome but no Flash please. 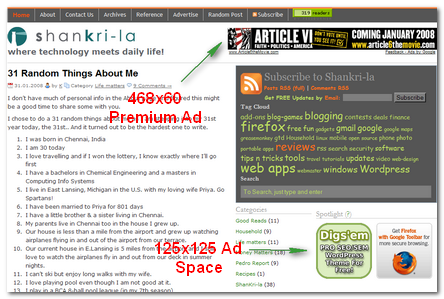 The premium 125×125 ad spots are featured in a prominent place in the sidebar, above the fold. They will appear site wide no matter where the reader navigates in the site for maximum exposure. With our RSS subscribers increasing everyday, you can get a text link to a targeted audience. Your text and tagline will appear in ShanKri-la RSS feed’s every post. With no competition from other ads for the reader’s attention, you can use this Google-friendly link (nofollow) to gain exposure to your site. Check out our ‘review’ tag to look at various reviews featured here. If you would like your product or service reviewed, feel free to contact me and we can discuss further. Ads relevant to the topics in this blog will be beneficial to our readers which will mean better conversion for you as an advertiser. Only family-safe images will be accepted. If you are interested, please contact me with your ad image and the link url. Feel free to ask any questions you might have about ad options or locations of the ad. You can cancel your ad term with 15 days prior notice.